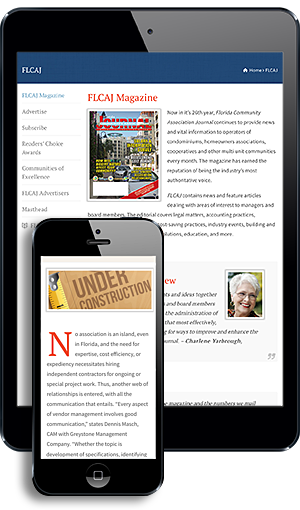 Many Florida communities have multiple associations governing different matters, sometimes with overlapping duties. The association that overlaps many communities may be called a “master” association. Master associations frequently maintain areas commonly used by many communities, such as roads, drainage and canal networks, and a front gate or entry. What law applies to a Florida master association? Is it governed by the Condominium Act, Florida Statutes Chapter 718? What if the master association governing documents do not indicate that it is a condominium association? Does the age of the community matter? The question of which law applies has important long-term implications because, as condominium association directors and managers know, being subject to the Florida Condominium Act mandates more significant record keeping and reporting requirements, as well as involvement of State of Florida regulators. Reversing decades of precedent, a Florida appellate court recently ruled that a master association of a Florida development made up of smaller sub-associations was not a “condominium association” as defined by the Legislature in 1982 when the association was created; thus, the association was not subject to the Condominium Act. In Dimitri v. Commercial Center of Miami Master Association, Inc., 43 Fla. L. Weekly D 1817 (Fla. 3rd DCA, August 8, 2018), the facts indicate that the Commercial Center of Miami Master Association was formed in 1982, operating as a master association for a group of buildings each with its own sub-association. Dimitri owned six commercial units in one of the sub-associations. In 2015, Dimitri sent a letter to the master association requesting production and inspection of specific documents pursuant to Section 718.111(12), the records inspection provision of the Condominium Act. When the master association refused to respond to his request, Dimitri sued the master association. The master association defended, asserting that it was not a condominium association subject to the Condominium Act’s records inspection requirements. The trial court concluded that the current statutory definition of a condominium “association” which was amended in 1991 did not apply retroactively to earlier created associations. Based on the definition in existence when the master association was created in 1982, the master association was not a condominium “association” subject to the Condominium Act. The trial court entered summary judgment for the master association. Had the 1991 amendment applied, the master association would be a condominium association and subject to the Condominium Act. This case is significant because of the confusion faced by many master associations as to which law applies to them. Especially if your community pre-dates 1992, then your master association may not be subject to the requirements of the Condominium Act. If you have any questions, contact your association’s counsel. If you have an option to renew a contract, what happens if the price is not specified? Will the option to renew be enforced? Maybe not! In a recent decision that has implications for Florida associations with contract renewal provisions, a Florida appellate court ruled that a renewal provision was too indefinite and would not be enforced. In Jahangiri v. 1830 North Bayshore, LLC, 43 Fla. L. Weekly D 1806 (Fla. 3rd DCA, August 8, 2018), a tenant entered into a written lease for commercial property. The lease was for five years ending on May 31, 2016, and the rental rate was $5,500 for the first two years and $6,000 for the remaining three years. The tenant notified the landlord beginning in November 2015 of its intent to renew the lease. After the landlord refused to renew the lease, the tenant sued the landlord. The landlord argued that the renewal provision was unenforceable because the provisions failed to state the amount of rent to be paid upon renewal. The trial court found the renewal provision to be “too indefinite” and “legally unenforceable,” and ordered the tenant to vacate the premises. The Florida appellate court affirmed the trial court’s decision in favor of the landlord. The court explained that the amount to be paid was an essential element to the agreement. The method for determining the dollar amount must be sufficiently definite. Here, there was no definite and certain agreement on what the rent would be upon renewal of the lease. Lesson to be learned: if you have a contract that contains a renewal option, confirm that a definite price or formula is stated in the renewal option! A desire to have a “fair” price or allowing for simple negotiations to set a renewal dollar amount is not likely to be sufficient. Senior Partner of Gelfand & Arpe P.A. Michael J. Gelfand, Esq., the Senior Partner of Gelfand & Arpe P.A., emphasizes a community association law practice, counseling associations and owners how to set legitimate goals and effectively achieve those goals. Gelfand is a dual Florida Bar Board-Certified lawyer in Condominium and Planned Development Law and in Real Estate Law, Certified Circuit and County Civil Court Mediator, Homeowners Association Mediator, an Arbitrator, and Parliamentarian. He is a past Chair of the Real Property Division of the Florida Bar’s Real Property, Probate & Trust Law Section, and a Fellow of the American College of Real Estate Lawyers. Contact him at ga@gelfandarpe.com or (561) 655-6224.